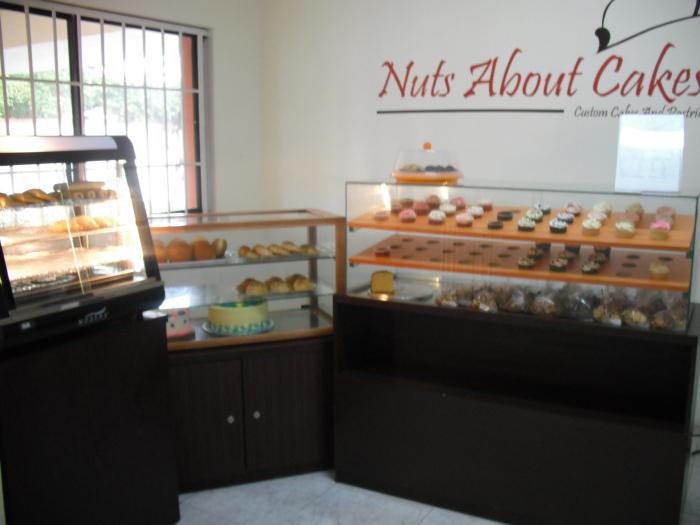 I’ve visited Nuts About Cakes bunches of times, and have turned into a verified Cupcakeholic! A friend of mine took me to get something light to eat, and that day, they happened to have samples of their red velvet and chocolate cupcakes, and that was the beginning of my addiction. In addition to their awesome cupcakes, they have other pastries such as cookies, muffins, croissants, chicken pies, meatpies and sausage rolls (the last three also come in mini-sizes). Nuts About Cakes also sells freshly baked breads – which I’m determined to stay away from, for fear of weight gain – I don’t know how much longer I can resist. They also make cakes and pastry-favors for events, such as weddings, parties, bridal showers, corporate functions and more. Alongside Nuts About Cakes is Olivia’s Café, which is as good as any café you can find abroad. Since my first foray, I’ve taken at least 4 or 5 friends separately to enjoy good food and drinks in a totally relaxed and easygoing setting. Olivia’s has magazines that you can read if you’re by yourself, or you can watch/listen to whatever’s playing on TV. They also have free wifi (YES!!!) and one cool thing is you can watch the bakery staff at work, while enjoying your slice of awesome cake, or anything else off their menu. The last time I went, I ordered two cupcakes from Nuts About Cakes, and a Chicken and Mushroom Crepe from Olivia’s – you can have Nuts About Cakes menu items while seated in Olivia’s Café. I’m normally a sweet crepe kinda gal, so I wasn’t sure if I’d enjoy a savory one but wanted to try something different. The chicken/mushroom filling was GREAT, but I wish the crepe was less dry. Other than that, it was pretty darn good. This is a GREAT place to go solo, on a date, to hang out with a friend or two, have an informal meeting, or even throw a birthday party/bridal shower/etc. The staff is always always courteous! Just be sure to take cash with you, in case the POS connection is faulty. My date had to drive to a nearby ATM to get cash to pay for my food. PS try not to get addicted because I certainly am! Had a cupcake from here recently. Wasn’t pleased at all. Maybe because I’d just had some really nice cake like an hour before. Or maybe because the cupcakes were put in the fridge? She I didn’t like it. The vanilla cupcake is now 350 o, maybe you should put up a picture of the current price.